Sunday the 16th we were treated with a short visit to Sophia Loren’s, Robert DeNiro’s, Ricky Martin’s, Ivanca Trump’s and Enrique Iglesias’ homes in South Beach. Well, we just drove by them on the way to the cruise port but it was exciting nonetheless. Our shuttle driver that took us from the hotel to the cruise port was kind enough to point them out. Our first day at sea was amazing. It started with a tour of the stars as you read above, an entertaining wait in line to get on the ship, a hunt for our cabin (it is amazing how they can cram so much storage space into a room the size of an overgrown walk-in closet), quick bite to eat, muster drill, sail-away party, a short tour of the ship for Jaime and quick nap for Lisa, dinner with two agreeable couples from Philadelphia (even though one couple lives in Florida now), a short walk around the deck to find stars which were hidden by cloud cover and a well deserved good night’s rest. I am having a blast. I should have done this sooner. I highly recommend the cruising thing. The value one gets for one’s dollar is unbeatable. Today we plan to go to an art auction where they are raffling spa packages (Lisa would like to win one) and who knows what else will come up. One thing’s for sure, tonight is the captain’s reception dinner so it is a formal night. I get to take Lisa to the prom I never had (long story). Lisa and I brought swanky clothes so we plan to do the evening right. I will be wearing my wedding tuxedo. 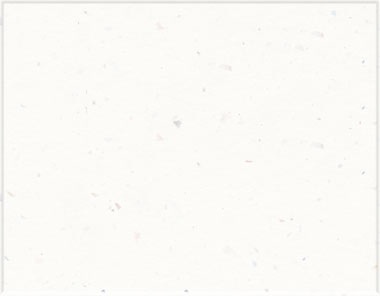 I will look goooooooooood ! 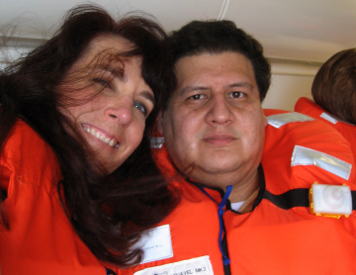 The photo above is Lisa and I during muster drill. If the ship were to sink we must head to our cabins to retrieve our life jackets and then head for the life boats (which the cruise line claims are unsinkable). 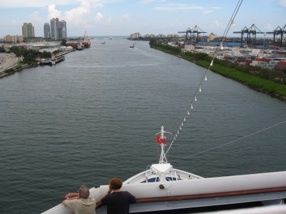 Below is a photo of what it looks like as the ship sails out of the port of Miami into the open waters of the Atlantic and into the Caribbean.